Gwaleshwar temple :- Gwaleshwar temple of later parmara era is situated about less than a kilometer from Un town in southward direction and it was erected on a small hill which is clearly visible from distance. The temple is intact after so many tidy winds of Islamic offenders during medieval period. On the opposite hill of the Gwaleshwar temple there are 5 small Jain shrines to commemorate the liberation of Suvarnabhadra etc. ascetics. 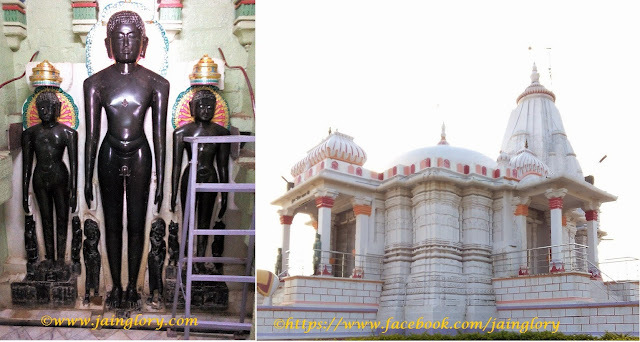 History of Gwaleshwar temple:- Gwaleshwar Temple is dedicated to 16th Jina savior Lord Shantinatha. The temple got its name which has a unique reason behind it. It is said that during medieval time, shepherds and cowherds used to get shelter in this temple during their daytime and they were devotee to Lord Shantinatha. Historically; the Gwaleshwar temple was constructed during 12-13th century AD. The temple was constructed during reign of later Parmara sovereign of Malwa region. The temple has been intact and perhaps gone through more than one renovation. The colossal image of Lord Shantinatha is dated to 1206 AD.The temple got renovation in 1936 AD. Architecture of Gwaleshwar temple :- Gwaleshwar temple is situated on a small hill which contains stairs starting from road passing near to the hill. The stairs leads us to the temple premise. The temple premise has initially a Maanstambh which is just in front of temple. There are two other small shrines on left and right side of the main entrance to gwaleshwar temple. The left one is dedicated to Lord Mahaveera and right one has image of Chandraprabhu. These Images are comparatively newer and perhaps installed after development of this place as a Jain pilgrimage center in modern age. The Gwaleshwar temple’s has three entrances with dwar mandapas which are situated in east, west and north directions. East and west entrances also have stairs which leads us to mandapa of the main temple. Mandapa is a square space which has a circular dome supported by pillared structure. The Mandapas leads us to holy of holies containing three ancient Parmara era sculpture of Shanti-Kunthu-Arah. There are two vedis situated on right and left side of mandapa containing several Parmara era sculptures along with ancient foot prints. Sculpture of Sambhavnath, footprints and part of ancient torana are main attraction of these vedis. Ancient Sculpture of Shanti-Kunthu-Arah :- Sanctum or Garbhagriha of the Gwaleshwar temple contains three colossal images of Teerthankar trio as Shantinatha,Kunthunatha and Arahnatha. The sculptures are sculpted with black basalt rock and Shantinatha is paramount lord of this temple. The sanctum or Holy of holies is a deep structure and about 10 feet deeper than mandapa. Colossal image of Lord Shantinath is about 12 feet high and Kunthunath and Arahnath are of about 8 feet height. The images are highly polished and great specimen of Parmara art. The Teerthankara sculptures are in Kayotsarga posture with serenity, tranquility on faces. Jina savior sculptures are depicted with Canopies over head, Whisk beares and such pratiharyas.